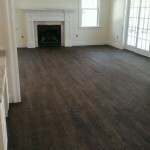 Hardwood Floor Refinishing & Staining in Marlborough MA | Central Mass Hardwood Inc.
Do you have an old looking hardwood floor? Does it have multiple scratches from years of wear and tear? Refinishing (or resurfacing) your floor is just what you need! First we’ll provide professional dust-free sanding to remove any existing finishes then we’ll apply 3 to 4 coats of oil or water based polyurethane. Finally, we’ll buff your floor clean to make your once old looking floor, brand new. We also offer a screen & recoating. We simply remove the top layer of finish and apply a new coat to revitalize your floor. This is for minor scratches / wear & tear..
Staining begins with the same process as refinishing. 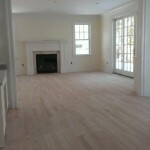 We will provide dust free sanding to remove old layers of polyurethane and to smooth your floor. Next we will apply a coat of stain of your choice. See some of our most popular stains for ideas. Finally, we will apply a couple coats of oil or water based polyurethane. We also have other finishes available, please call us at 508-460-0199 to learn about our products or ask for a free quote!